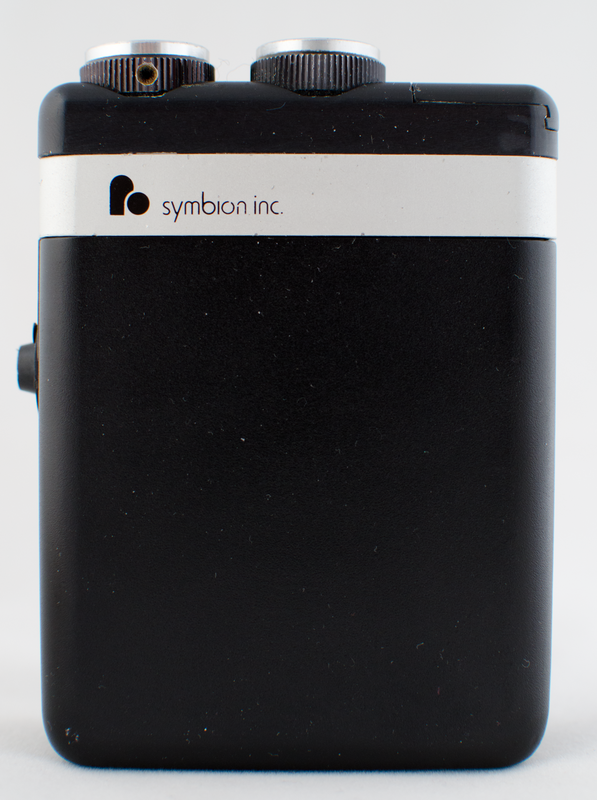 Symbion, the company that made Jarvik 7 artificial hearts, also made a brief foray into cochlear implants. The company was subsequently purchased by Richards Medical Company, a member of the Smith+Nephew group. The processors may be branded either Symbion or Smith+Nephew. 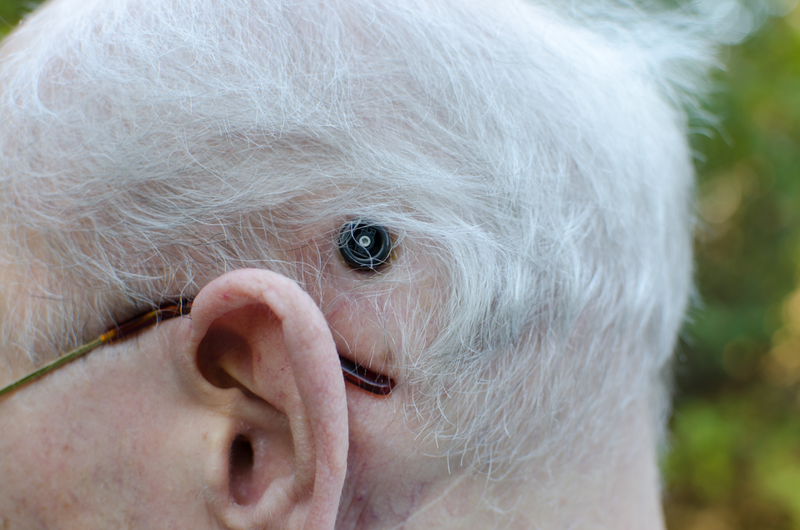 The Ineraid implant is quite simple – several electrodes attach to a percutaneous connector – one that goes through the skin. The implant received an FDA investigational device designation, and a hundred or so patients were implanted beginning in 1985. The volunteers who considered participating in the clinical trial received this information guide. The device never received FDA approval, as transcutaneous devices with magnetic headpieces became the preferred choice in the marketplace. The Owner’s Handbook includes tips for self-guided rehabilitation therapy, how to carry a spare battery, and how to care for the pedestal to prevent infections. The six balls along the main part of the array are the active electrodes. The ground, or reference electrode, is the larger ball on a separate wire. The outer ring of the black pedestal is affixed to the skull, and the inner portion comes through the skin where the external processor makes its connections to the electrodes. The processor is housed in an aluminum case, and has only two controls – power/volume, and sensitivity. A panel slides off to reveal a compartment for a standard 9V battery. 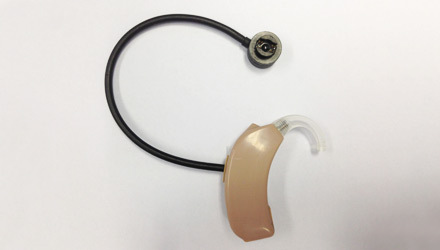 The ear hook assembly connects to the body-worn processor with a cable. The cable has one wire for each electrode, plus the ground wire. 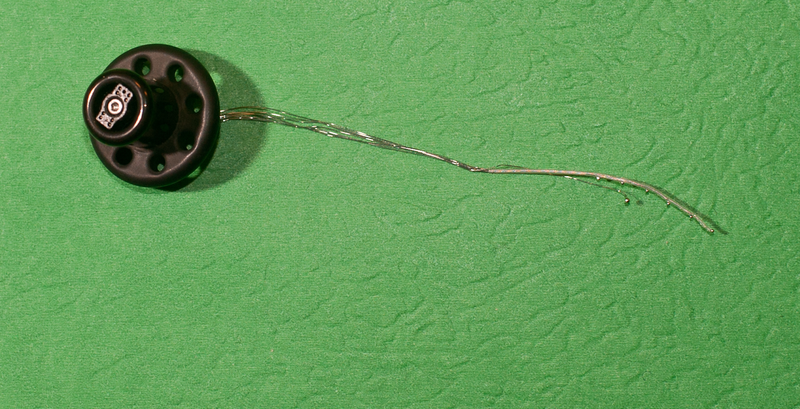 The black wire coming out of the earhook goes to a connector that plugs onto the pedestal. 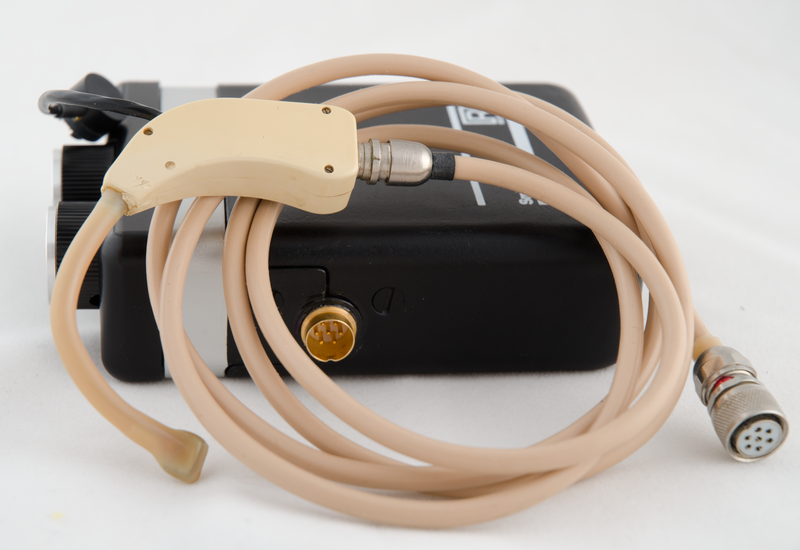 This performs the same function as the headpiece in modern cochlear implant systems. This simple arrangement was specifically chosen to be upgradeable using only external components. Any advances in electronic hardware and software can be implemented with external components alone, requiring no further surgery. The microphone port is visible in this view of the ear hook. It appears to be a precursor to today’s T-mic from Advanced Bionics. Direct access to the electrodes of the Ineraid device makes it an ideal vehicle for testing new stimulation strategies. The original processor does not have the desired flexibility for research purposes. While the electrodes can be stimulated in the laboratory environment, a wearable processor would enable volunteers to try different strategies for longer periods of time. 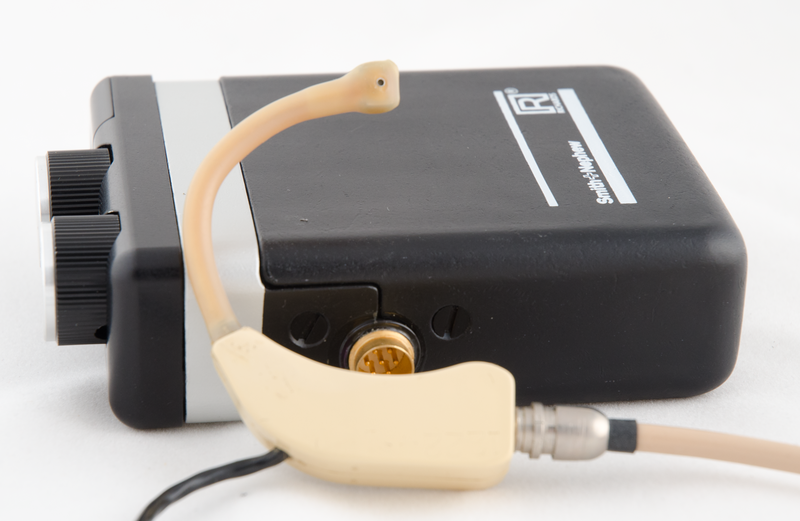 To that end, researchers at the Massachusetts Eye and Ear Infirmary Cochlear Implant Research Lab and at the University of Geneva arranged for the production of the Geneva processor. The National Institutes of Health (NIH) funded the project in the United States. Hardware design and fabrication were done by engineers at the Geneva School of Engineering. 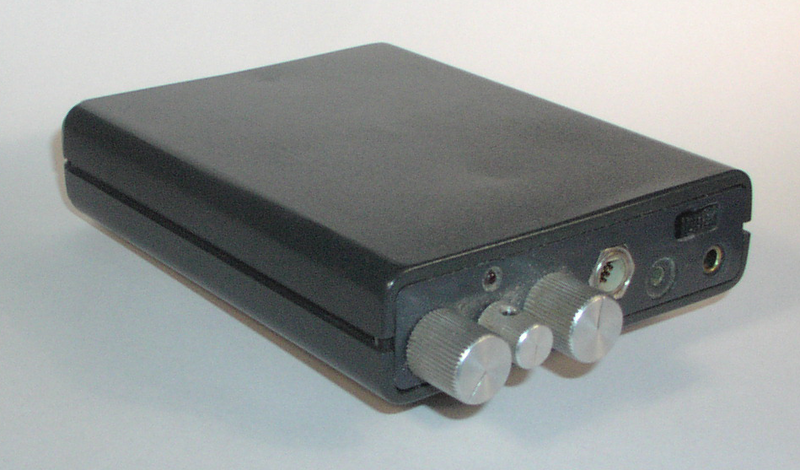 The purpose of the Geneva processor was to provide a wearable platform on which new speech processing strategies could be evaluated with long term use, as opposed to testing during brief visits to the research labs. One of the first and most important strategies tested was the CIS strategy, which had already demonstrated superior results in the lab. There were about 20 Geneva subjects in the US and a similar number in Europe. About half of them are still using the devices on each continent. In 1995, MED-EL developed the CIS LINK, an ear hook to interface between the MED-EL processor of the time, and the Ineraid implant. 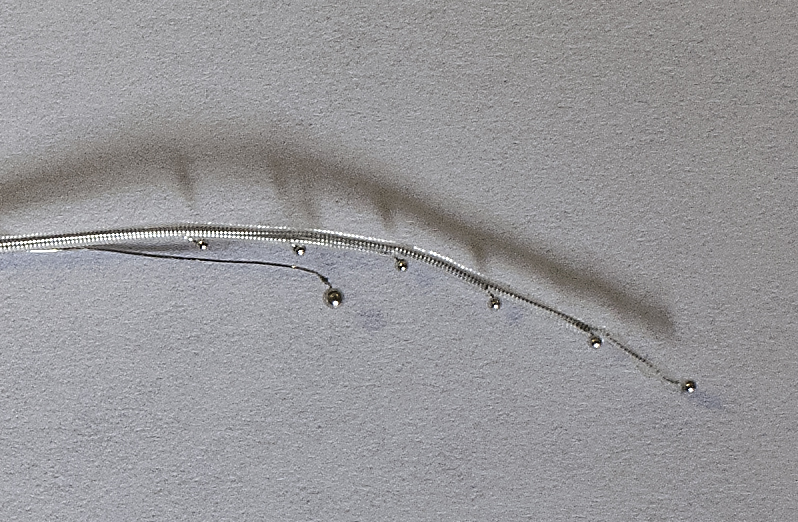 Because the processors expected to interface to the internal electronics of the MED-EL implant, this earhook incorporated the electronics of the MED-EL implant, providing the critical piece of interface electronics. 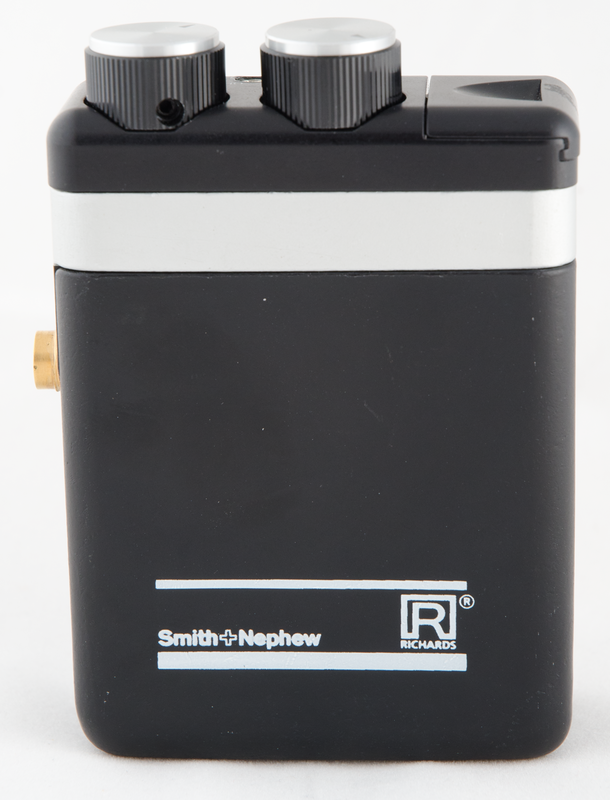 This entry was posted in Blog and tagged CIS, cochlear implant, Ineraid, MED-EL, Smith+Nephew, Symbion by CochlearImplantHELP. Bookmark the permalink.